Are you the proud owner of a new Galaxy Note 8.0 or thinking about buying one? The Note 8.0 (read our review) is one of our favorite Samsung tablets – it’s just the right size and has a good display, great pen support, and equal awesomeness for entertainment and productivity. If you’re looking to take better advantage of the Note 8.0’s features and functionality or just want something attractive to carry it around in, this guide is for you. Below you’ll find the best cases and bags, tools to aid your productivity, plus multimedia connectors and docks. Did we miss anything? Shout out your favorite Galaxy Note 8.0 accessories in the comments. The Note 8.0 works with smart cases that can put the tablet to sleep when you close them or wake them up when opened. Samsung’s official Book Covers are nice but don’t always lay flat, so the screen might be on without you knowing. As an alternative, check out MoKo’s case. The screen cover lays flat more reliably and folds into a stand that holds the Note in two positions. Plus, it comes in a dozen colors and is a lot less expensive. If a book-style cover doesn’t suit and you’re looking for a good, lightweight sleeve, this one from Built is the perfect size for the Note 8.0. The neoprene material will protect from minor bumps while the tablet rides around in your bag and the soft inner material won’t scratch the screen. 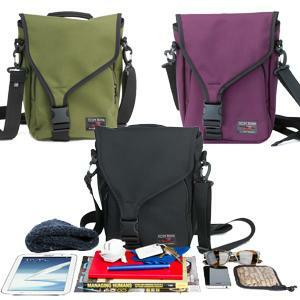 The front flap hides a small zippered pocket for cords and other accessories. We also like that it comes in fun colors and patterns. Chances are if you’re down with a stylus-optimized tablet you’re probably not afraid to rock an old school (or old world) look. 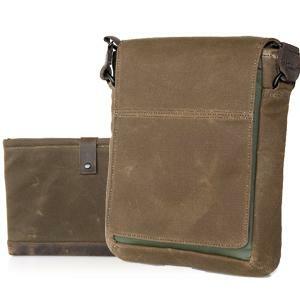 If so, then you definitely need to check out the Outback products from Waterfield design. This San Francisco-based company makes a lot of great bags, cases, and sleeves for tablets of all sizes, including the Note 8.0. The Outback sleeve features waxed canvas which is nicely accented by the leather trim. The protective neoprene inside is thick enough that you can toss the Note 8.0 in a bag without having to worry about it getting knocked around yet still pretty light. Pair this sleeve with the new Muzetto Outback and you’ll have a matching set. 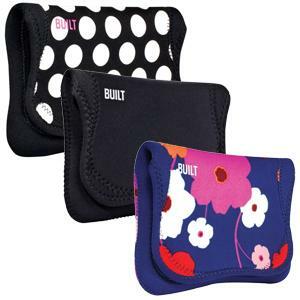 The Personal and the 10-inch sizes are big enough for the tablet and sleeve plus a few other items. It’s great for people who like to travel light. Technically, this bag is made for the iPad, but if you’re not too Samsung-centric to buy something made for that other tablet the Ristretto has many wonderful qualities. The compartment made for the tablet is padded well enough that you won’t need a sleeve to keep the device safe. For a small bag, the Ristretto has a lot of compartments and pockets that fit more than you’d guess at a glance while keeping everything separate enough that you won’t have to dig around for things. We’re also fans of the interchangeable straps and the color variety. Doing serious work with a tablet usually means getting a solid portable keyboard for typing things longer than an email or status update. There aren’t many good keyboard/case combos out there for the Note 8.0. Luckily, good standalone keyboards are easy to find. 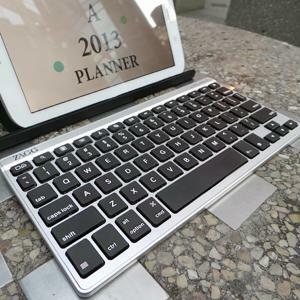 We like the rechargeable, Bluetooth-enabled Flex from ZAGG because it’s light and compact but not so small that the keys are cramped (as is the case with many iPad Mini keyboards). Another great aspect is that it works with both Android and iOS devices and can connect to phones and tablets, so you’re not restricted to just one device. The included cover acts as a stand and the whole thing weighs just over 11 ounces. 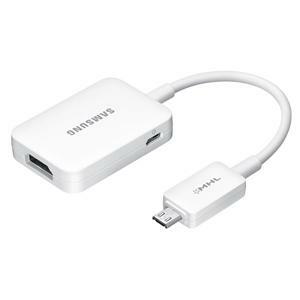 Unlike almost all of Samsung’s other tablets, the Galaxy Note 8.0 has a Micro USB port instead of a proprietary one. This port is OTG compatible, meaning it’s possible to connect USB devices to the Note as long as you have the right dongle. OTG connectors are very common and don’t cost much but are amazingly useful. 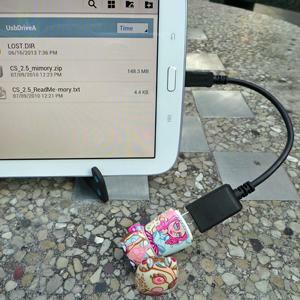 You won’t need a special camera connection kit to plug in a USB flash drive or a USB memory card reader. You can even connect a keyboard or mouse if you really want to do things old school. The S Pen that comes with the Note 8.0 is nice and long, but isn’t as big as a traditional pen. Those who are particular about weight and heft when writing might be tempted to check out Samsung’s S Pen with Eraser which is shaped more like a traditional pen. It’s an okay choice, though still on the skinny side. Plus, the eraser part has the potential to scratch the screen. 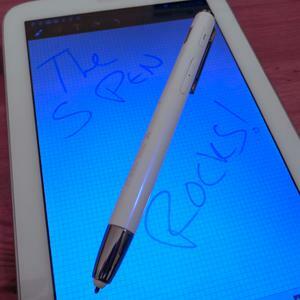 We like the BT S Pen much better even though the functionality is a little out there. This Bluetooth version of the S Pen is about the thickness of an executive pen and the side button is placed so that it’s much harder to click accidentally. Aside from the normal S Pen features, this stylus is also a Bluetooth headset. Yes, you can take calls with it. And yes, it works with the Galaxy Note 2 as well. It’s not an official accessory for the U.S. version; as of right now imports aren’t hard to find. 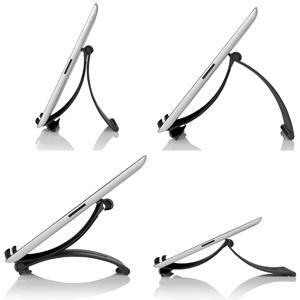 Many of the cases we found that do double duty as tablet stands only offer one or two resting angles and aren’t always stable enough to hold up to tapping or on-screen typing. The Fixie from Incipio is versatile, sturdy, and really clever, which makes it a favorite. 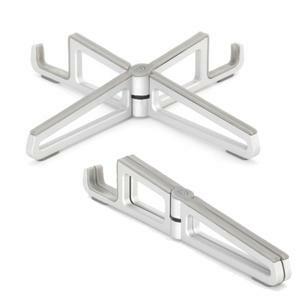 The stand is made up of two pieces that fit together in four different ways for four different viewing angles. 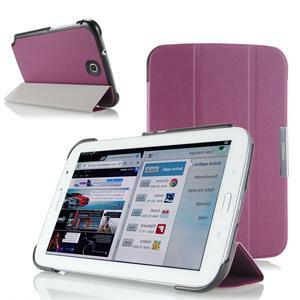 Rubber grips are there to keep the tablet steady and the aluminum material used keeps it light while remaining strong. When not in use, the two halves are compact enough to slip in even a small bag without taking up too much space. Want a stand that is even more compact and light? There are several inexpensive plastic stands like this one online and in retail stores. If you don’t mind spending a little extra money, the Griffin XPO is a worthy upgrade. It folds up smaller and flatter than a pair of sunglasses and adjusts to fit almost any size tablet or smartphone. The XPO will hold the Note 8.0 in portrait or landscape and the groove is big enough that the tablet will still fit even with a case on. 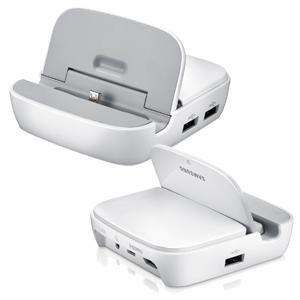 With this dock you can hook up three USB devices, an HDTV or monitor, and a set of external speakers to the Note 8.0, all with one connection. That makes it a powerful accessory for productivity, yet it’s also great for making your existing TV a smarter one. With a mouse you can control the Note from across the room while sitting on the couch. And with the ability to connect a flash or external SSD via the USB port, you can play music videos you’ve downloaded as well as streaming media. There’s only one drawback: Samsung doesn’t list this dock as officially compatible with the Note 8.0. However, several users gave it a try and found that they do work together. If all you want to do is connect the Note 8.0 to an HD screen and you don’t need the extra ports, this Smart Adapter is just as easy to hook up and is less expensive. Just plug your normal HDMI cable into one end and the Note’s screen appears on the big screen. Works great for watching movies, playing games, or making presentations. 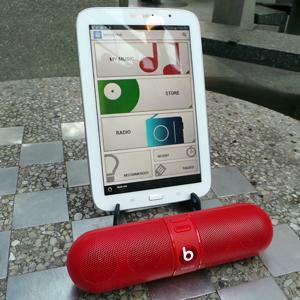 A light and compact tablet deserves a light a compact portable speaker to accompany it when on the go. The Beats Pill pumps excellent audio for something so small and connects via Bluetooth or via the headphone jack (cable included). Long battery life coupled with ultra portability mean you won’t need an outlet for an impromptu dance party. The Pill comes in a fun shape and you can get it in white to match the Note 8.0 or a number of other bold and fun colors. For those times when you need to keep your jams private, we recommend the Tracks HD line since every aspect from the sound drivers to the headband to the cord are interchangeable. You can build a pair to match your favorite outfit or the Note 8.0 or snag one of the designer pairs from Tokidoki, deadmau5, and other famous fashion icons. 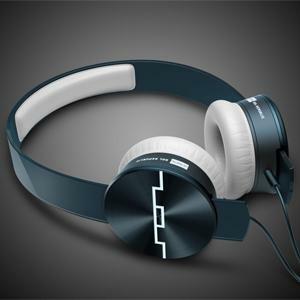 Beyond the aesthetic value the Tracks HD offer good audio quality for a decent price. They’re made to last as well – the headband is almost indestructible and even if the cord goes out due to wear, it’s replaceable for around $20.